Rumors have been circulating, but we now know for sure. Ben & Jerry’s has nearly doubled their Non-Dairy frozen dessert offerings! After last year’s successful introduction of Non-Dairy ice cream flavors, fans clamored for more. They reportedly received emails, tweets, and phone calls requesting a bigger selection of decadent flavors loaded with “everything but the cow.” Ben & Jerry’s has responded with three new Non-Dairy flavors, and this accounts for HALF of their newly released flavor line-up for this year! These new pints are all certified vegan, labeled as non-GMO, and made with a base of almond milk. 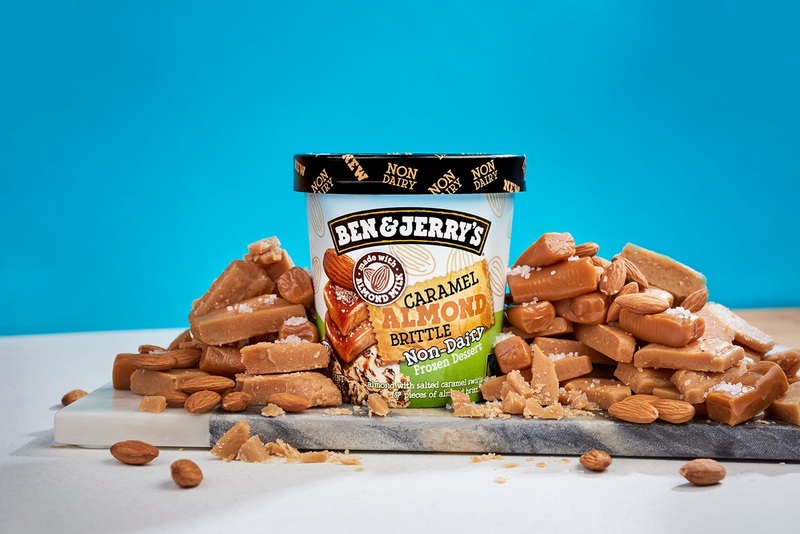 Caramel Almond Brittle: We’re going nutty over this idea! The almond base contains salted caramel swirls and pieces of vegan almond brittle. 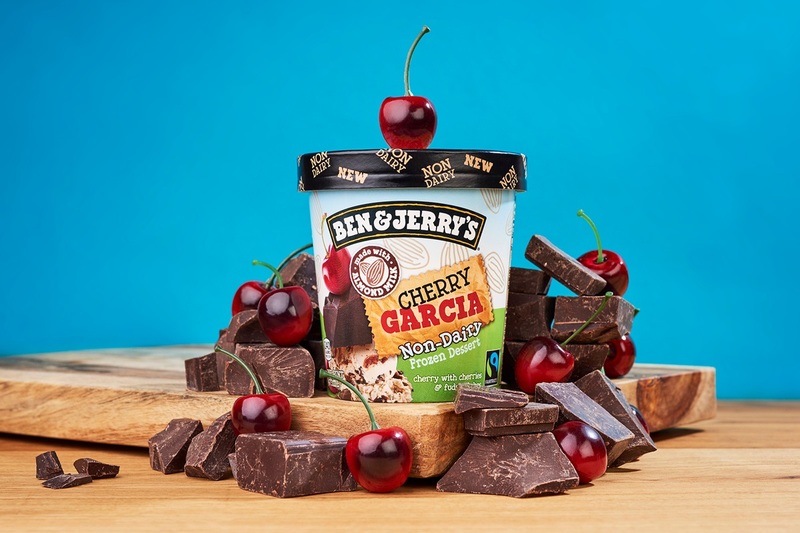 Cherry Garcia: Ben & Jerry’s is getting quite vocal about their commitment to dairy-free. And we expect fans to swoon over this Non-Dairy riff on their classic cherry ice cream with cherries and fudge flakes. 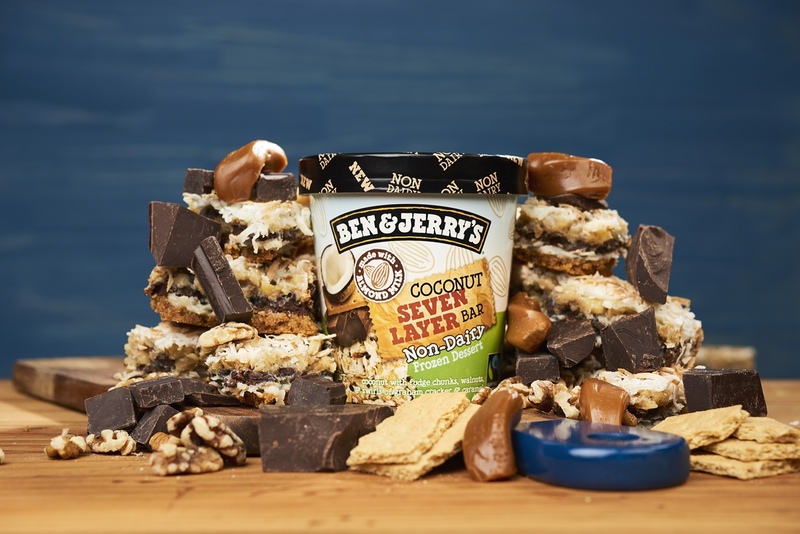 Coconut Seven Layer Bar: The mixologists at Ben & Jerry’s are piling on the flavor. 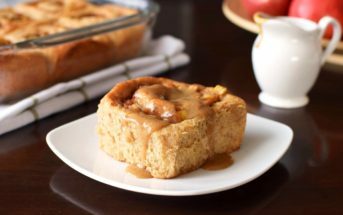 This combination contains coconut, fudge chunks, walnuts and swirls of graham cracker and caramel. According to the Ben & Jerry’s website, all three of the new Non-Dairy flavors do contain soy (lecithin or oil) and carrageenan. The Cherry Garcia appears to be made without gluten, but it isn’t certified gluten-free. The Coconut Seven Layer Bar does contain wheat-based grahams. And for those who are strictly gluten-free, the Caramel Almond Brittle has a wee bit of barley malt. Our policies and procedures are such that if peanuts or tree nuts (almonds, cashews, chestnuts, walnuts, pistachios, pecans, hazelnuts/filberts, macadamias, Brazil nuts, pine nuts) as well as eggs, milk, fish, shellfish, wheat, soy, seeds, and lupin are not listed in the ingredient declaration or in an Allergy Information statement in boldface on the package, then the product is safe to consume for persons with allergies to those ingredients. 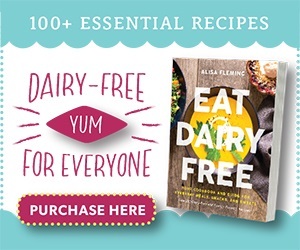 I did not see milk listed in the allergen statement on their Non-Dairy Frozen Desserts. However, it’s essential to always check the pint ingredients and labeling to verify before consumption. And always contact the company directly if potential cross-contamination is a concern for you. See our Honest Review of the 4 Other Ben & Jerry’s Non-Dairy Flavors HERE! On the last roll-out, I only liked the peanut butter cookie flavor. I tried the caramel almond brittle, this time, and was very disappointed. I’m expecting to like the 7-layer coconut bar, and I have no idea how I’ll react to the Cherry Garcia. I only liked the peanut butter cookie, enough, to buy it a couple of times. It has about 400 calories more per pint than my favorite So Delicious. I really like the So Delicious chocolate coated bites. I used to really like Ben & Jerry’s and I remember looking everywhere for Fossil Fuel when the Bi-Lo grocery stores were acquired by Food City in my state. I’d like to see Ben & Jerry’s make a vegan caramel core with chocolate and vanilla ice cream and a half baked. I don’t think they’ve make one with chocolate ice cream yet, which is a shame because it is my fav. Thanks for sharing your take on the flavors Mia! Will they be coming to the uk ?? I’m not sure Tracey! Are the other non-dairy flavors there? 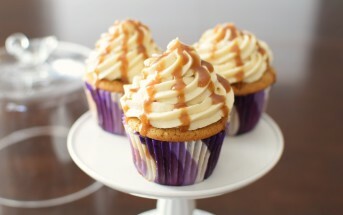 I also wish I didn’t have carrageenan in them, but I am sooooo excited for a caramel one without coffee! And Cherry Garcia sounds delish. I can’t eat the cashew milk ice cream so I’m thrilled to have more variety with these. Yay for new flavors! Yum, I want them all. 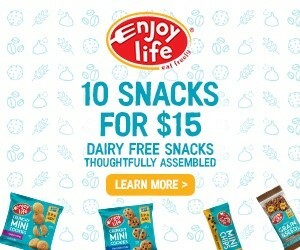 While it’s great that they are releasing more dairy free options I have to admit I wish they were a bit cleaner ingredient wise and made in a dedicated facility. For folks who have a serious dairy allergy this doesn’t help them at all. 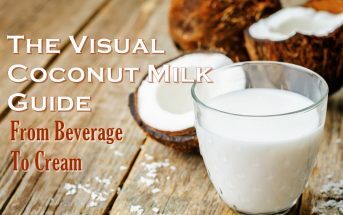 It seems that they are catering to folks who eat dairy free just as a preference. I will admit that I fall into that later group but still, with companies like Coconut Bliss offering such a stellar product I feel like there’s room for improvement with Ben & Jerry’s. Just my two-cents 😉 I still miss half baked! I agree with you on many counts Lauren. But one thing that I don’t think most people know is most dairy alternatives (including ice cream) aren’t made and packaged in dedicated facilities. Many are actually on shared lines with dairy products even, but strict allergen protocols are followed. 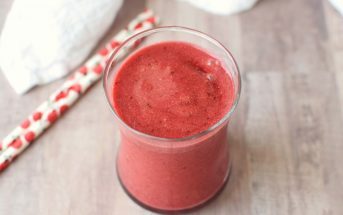 Fluid dairy products tend to be easier to transition between for many manufacturers with allergen protocols then say chips, where powders can float or easily get “caught”. Still, it’s always up to the individual to evaluate safety for their needs. Thanks for sharing your feedback! I’m not sure. Are the other Ben & Jerry’s Non-Dairy flavors in Canada? If so, then I would guess they will roll these out there too at some point. They all sound so good, but I cant wait to try the seven layer coconut bar! Cherry Garcia was always a favorite when I use to eat the regular B&J. I saw this a couple weeks ago and I’ve been waiting and watching, for Coconut 7 Layer Bar. I could eat a whole pan of those bars! I wasn’t a fan of the last Dairy Free Ben & Jerry’s I had (didn’t take more than a couple bites and threw it out, just wasn’t a fan) but I’m willing to give these new flavors a chance. Now just hope my store gets them soon. I’m curious about the Brittle one Sarah, but a little concerned it will be too sweet. They definitely pack the sugar in! Ben & Jerry’s keeps missing the mark (I have many issues with that company, but I’m specifically referring to their inferior nondairy ice creams here 😉 )…. So Delicious cashew milk ice creams and Coconut Bliss ice creams reign supreme with non-dairy, in my opinion (and the latter companies actually care about their consumers). We went to a Ben & Jerry’s and were super excited that they had df options. Ooh, so you saw more than one?! I’ve tried the PB & Cookies in store (holy sweet! ), but am happy to hear they may have more of a selection now. It is fantastic to see new options everyone will enjoy!